We are now pleased to announce that we have an in-house, laser engraving service available. Table numbers & names, including wedding date and Bride & Grooms name. Save the Date – Serves as a handy reminder to those to store your invitation on the Save the Date holder or stand. There are no minimum or maximum ordering quantities for this service. If you would like to discuss this opportunity further please do not hesitate to contact us. 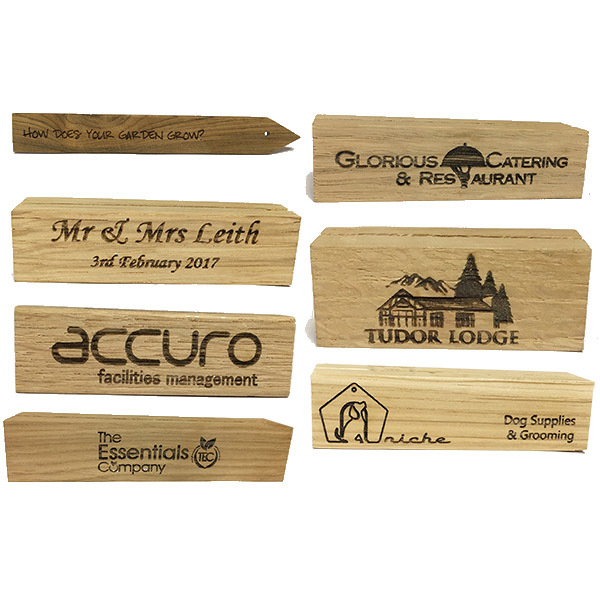 Choose the product you’d like to have engraved. Copy of image or text. We will then create a production sample using your image and e-mail a copy back to you along with a quote for the work. Make your payment by card over the phone or BACS. We will then create your order. £1.20 (inc VAT) per item with a minimum spend on printing of £25. 10 card stands = 10 x £1.45 = £14.50 plus printing minimum charge of £25. Total Cost = £39.50 inc VAT (£32.92 ex VAT). 25 card stands = 25 x £1.38 = £34.50 plus printing of £30 (25 x £1.20). Total Cost = £64.50 inc VAT (£53.75 ex VAT). 50 card stands = 50 x £1.38 = £69 plus printing of £60 (50 x £1.20). Total Cost = £129.00 inc VAT (£107.50 ex VAT).